FILE: NATO troops on a street in the Afghan capital Kabul after a Taliban suicide attack on NATO convoy wounded three civilians in September 2017. 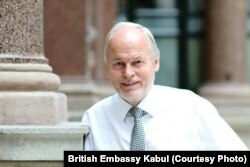 Career British diplomat Nicholas Kay is currently serving as NATO’s senior civilian representative in Afghanistan. In an interview with Radio Free Afghanistan, he said that any agreements with the Taliban on terrorism and counterterrorism or connections with international terrorist groups will need to contain verifiable and monitorable components. Radio Free Afghanistan: The Taliban has so far refused to engage in direct talks with the Afghan government. What does it mean then for there to be an intra-Afghan dialogue? Nicholas Kay: An intra-Afghan dialogue means a dialogue that involves all Afghan stakeholders, and that is definitely with Taliban but also with the central role for the government of Afghanistan and other political actors and civil society and women’s groups and young people, as well. What we are hoping is that there will be a very inclusive dialogue between Afghans as they chart there future and agree their terms for peace. Radio Free Afghanistan: Will any peace deal be reached without the participation of the Afghan government? Career British diplomat Nicholas Kay is currently serving as NATO’s senior civilian representative in Afghanistan. Kay: In the end, the Afghan government will need to agree on a peace deal. The Afghan government is the sovereign, elected government of this country. But it’s not exclusive to the government of Afghanistan, as well, and over the last few days there’s been a lot of progress in Kabul, I believe, as political leaders of all persuasions from across the spectrum are sitting together with President [Ashraf] Ghani to try to put together what will be a united Afghan delegation for eventual talks with the Taliban. Radio Free Afghanistan: Has any decision been made on troop withdrawals from Afghanistan? Kay: Absolutely not. No decision has been made at all. We are very clear that NATO has come together united, and we will eventually make decisions about our future presence together, as well. Radio Free Afghanistan: Given that the group had hosted the founder of Al-Qaeda, Osama bin Laden, in the 1990s in Afghanistan, can any Taliban promise that Afghan soil will not be used by terrorists be trusted? Kay: Obviously, the past gives rise to a lot of doubts and a lot of suspicions. And it’s not just in terms of Taliban connections to Al-Qaeda but across the spectrum there is a deficit of trust in this country. That’s a challenge which will need to be addressed in the future. Any agreement on terrorism and counterterrorism, connections with international terrorist groups -- those agreements will need to contain verifiable, monitorable components. Radio Free Afghanistan: Speaking of terrorist groups, how big a threat is the Khorasan branch of the Islamic State in Afghanistan? Kay: It’s a threat that we should take seriously and absolutely are taking seriously. Their presence at the moment is limited to parts of [small] geographic areas really. But they are persistent, and they are responsible for some atrocious high-profile terrorist attacks against civilian targets in Kabul and elsewhere, so it is a threat and it’s something which is needed to be taken seriously. Radio Free Afghanistan: Pakistani Prime Minister Imran Khan said in late March that creating an interim government in Afghanistan would, as he described, smooth out peace talks between the United States and the Taliban. What’s your take on this? Kay: I think it’d be wrong to speculate about an interim government at all. This is now a period where elections for the president [are scheduled] for September 28 this year, and it’s a high priority to help the Afghans arrange and organize those elections on time. Radio Free Afghanistan: If a peace deal is not reached this year, will there still be presidential elections? Kay: Absolutely. We are very firmly committed to pursuing both the peace process and elections, and the worst possible scenario is to have no peace and no elections. So, the elections for September are our high priority. And we do believe that, at this moment, it’s possible to hold those elections. Radio Free Afghanistan: Some segments of Afghan society, such as women and youth, are concerned that their hard-won rights for nearly two decades since the fall of the Taliban regime might be compromised in a future peace deal. How will NATO address such concerns? Kay: You’re absolutely right. The Afghanistan of 2019 is not the Afghanistan of 2001, when the Taliban were in power in Kabul. We have to remember that, even in 2001, they were not in power across the whole country. Afghanistan is transformed, and women’s right and girl’s education are just two of the very important parts of Afghanistan’s transformation over the last years. The free media, the institutions, the democratically elected parliament, and government: all of these are the achievement, which we believe [should be] built on if the peace needs to be sustainable. So, we advocate for that as NATO, and we absolutely encourage and support civil society groups, women’s groups to make sure that they are fully represented in any kind of intra-Afghan dialogue. Radio Free Afghanistan: What is NATO’s long-term commitments to Afghanistan? Kay: The mission that we came on is a mission that Afghanistan’s territory would never again be used for international terrorists to attack our homelands. That remains the mission, and NATO is absolutely committed to that mission and to achieving it. When that mission is no longer there, when there is a sustainable peace, and there are verifiable, monitorable agreements in place over terrorism, then I would imagine that our NATO governments will sit together and decide on the future presence of NATO. There is a commitment at the moment to a very strong enduring partnership between NATO and the Afghan people. We are committed to our task of training and advising the Afghan national defense and security forces. It's a task which we anticipate will be required for some time to come.